Planning a home renovation? Savvy Design & Renovation offers a full range of high-quality, reliable services, from conceptual development and interior design to construction. For years we have been delivering superior results for both residential and commercial customers. Fill the form for a callback. We will answer your questions and schedule an estimate. Our clients are seeking fine craftsmanship and top-grade final product. Our team has the experience and expertise to handle your project from design to completion. We work together to make every project a success. Integral to any renovation is a keen attention to detail and preparedness for any hidden surprises. Whether the renovation involves one room or the entire house/apartment, reinventing your space by modernizing your interiors to better match your current tastes, needs and comforts requires careful planning and thorough execution. 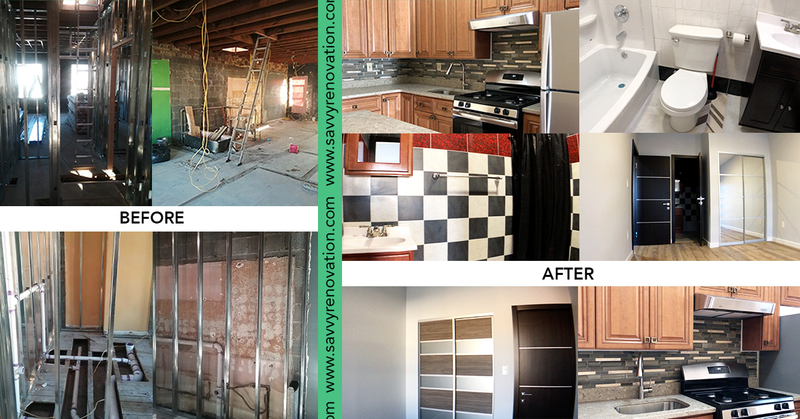 Savvy Design & Renovation offers a complete renovation experience from start to finish, including design, drafting, project management, and construction. We strive to achieve the outstanding quality, on time and on budget completion of your renovation project. Whether you need a quick update to a retail showroom or a total gut renovation of a warehouse, Savvy Design & Renovation will complete your project to your complete satisfaction. Whether your project is big or small, simple or complicated, you can expect to receive the same level of dedication and excellence. We know the difference between acceptable and outstanding is the execution of all the small details. Kitchen is the heart of every home. A great kitchen remodel should marry great design, quality workmanship and an efficiently choreographed schedule to minimize the impact of kitchen remodeling on your lives. We'll makeover your kitchen and remodel it to suit your lifestyle. Whatever your budget, and whatever the size of the bathroom, we will work with you to make sure that it changes into a space that will delight you. Over the course of your life, you will have spent almost two years in the bathroom. Make this time as enjoyable as possible by giving yourself the spa-like bathroom you've been dreaming of. Don't know where to start your renovation? Start from a top-quality interior design project. Our team offers high-touch, end-to-end design services for residential and commercial projects. Based on your needs and project scope, our designers will create high-quality 3DMax renderings. Using fine details in lighting, texture, and color, our interior renderings appear absolutely realistic, letting you visualize all of your "dream home" ideas. Savvy Design & Renovation provides a full range of high-quality home services including painting, plumbing and electrical work of any complexity. We will answer all of your questions and schedule an estimate. 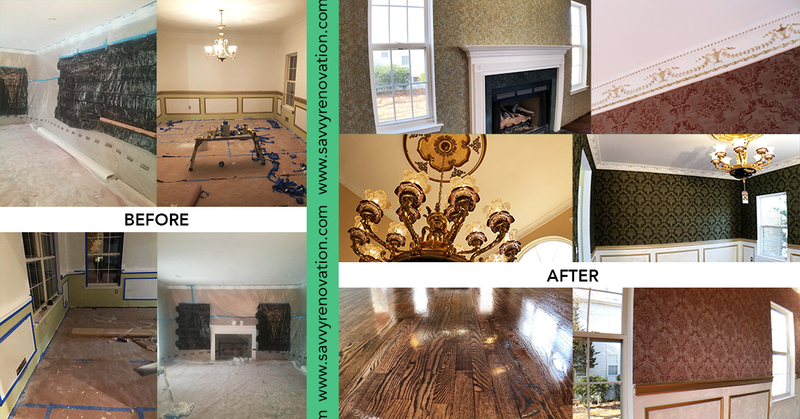 Savvy Renovation was established with a clear mission: to provide a professional general contracting service in a friendly, honest and reliable manner, which does not just satisfy, but delights our customers. We spent more than ten years of our lives to become the best. Our experience is our primary and unique instrument. We provide the best price-quality ratio on the market. From the moment your renovation begins, you'll be partnered with a dedicated Project Manager and our Quality Assurance team, handpicked to oversee your project. Consistently on site and reporting back to you, your Project Manager will ensure all procedures are being completed to the highest degree of qualit. We offer free high-touch, end-to-end interior design projects to our renovation clients. Based on your needs and project scope, our designers will create high-quality 3DMax renderings. Using fine details in lighting, texture, and color, our interior renderings appear absolutely realistic, bringing to life all of your "dream home" ideas. We are one of the leading firms by delivering quality and value. Our team consists of skilled and fully accredited team of high-caliber professionals, who have dedicated their lives to what they do. Asking the right questions and getting the right answers are keys to undertaking a successful construction project. If you find yourself asking these questions, we can help provide the answers. Setting a budget for your place to remodel and staying within it sounds so obvious and simple, but it's harder than you think. The first is how much you can afford to spend. Take a look at your finances to determine this number. Interior design is the art and science of enhancing the interiors of a space or building to achieve a healthier and more aesthetically pleasing environment for the end user. You can be crafty in many different ways. For example, you can take a piece of wallpaper that you like and frame it, creating an interesting display for the dining room, office, etc. Spend your money on items that will get the most amount of use. For example, in a kitchen, invest in high-quality cabinets and appliances, versus lighting or a backsplash. Buying quality products will ensure your renovations are up to your standards for years to come. Identifying your style will allow you to stay focused when shopping for materials and communicating to contractors what you'd like done. Every project is special for us! The job that has to be done is not the only our goal. We do the job with a great desire, we create, we achieve the quality with a warranty for years. The completion of the project is not the moment when the job is done! You'll be happy to call us for the new project again and again. When the job is completed, and you are happy with the result, you will get a post-construction cleaning as a gift. So your place will be ready to move-in right away!